With National Charter Bus, you’re in control of where you go, when you leave, and how long you stay at each stop. Craft your own itinerary and leave the transportation logistics to us! No matter how many buses you need or which amenities you require, we’re always available to find the best travel option for your group. National Charter Bus works with charter bus providers across the country to bring you the best in the business when it comes to group travel. 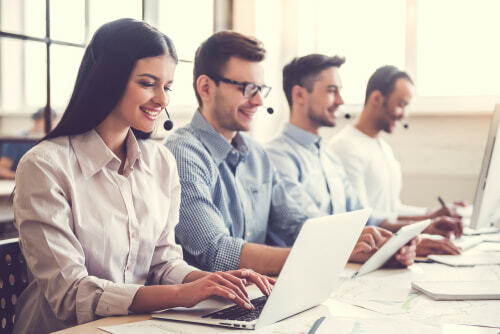 Our reservation specialists work around the clock to provide free quotes, keep up with current trips, and ensure that your trip progresses as smoothly as possible. We’ve logged over 1,000,000 miles of travel throughout the nation with zero accidents on record. National Charter Bus has been trusted to transport large school groups, corporate business groups, and various other passengers for an array of events. Trust us to provide safe, efficient, and comfortable charter bus travel to your group for your next journey. National Charter Bus is committed to keeping your traveling group on schedule, no matter where you’re headed. We instruct every driver to plan to arrive to each pickup point at least 15 minutes earlier than scheduled, helping your group to stay on track through every leg of your trip. Our operations team carefully monitors each driver’s location as they travel to pickup and dropoff points. We’ll always keep you informed of traffic jams or unexpected delays, should they arise during your trip. Trust us with your itinerary and you’ll never miss a beat. Not sure which bus you need? We’ll listen to your concerns and search our network to find the best bus for your group. We’re not satisfied until you find a bus that perfectly suits your needs.National Charter Bus employs a team of 24-hour reservation specialists who are always available to help you book a charter bus, calculate a free quote for your trip, modify an existing reservation, or give you an update on your upcoming travels. We’re also happy to answer any questions you may have about our services, from bus sizes to on-board amenities and everything in between. All buses booked through National Charter Bus include modern safety features and are up-to-date on required safety standards. Many models of buses in our network include top features like improved 3-point safety belts for optimal customer safety, front collision guards and enhanced bumper designs for cushioning any possible impact, and sharp corner lights for the best possible driver visibility. Concerned about the safety specs of your vehicle? No worries-- let your reservation specialist know about your concerns and we’ll make sure you’re matched with the perfect charter bus for your trip. We only work with certified drivers who have gained sufficient experience in transporting large groups across long distances. We understand how important it is to feel safe with your group, especially when you’re traveling with family members or young children-- that’s why we’re committed to only working with the best drivers in the business. All drivers must pass a background check, a drug test, and a series of examinations before being cleared to claim your trip. 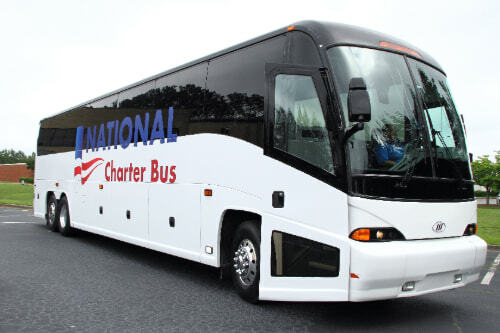 When you book with National Charter Bus, you’re in control. Craft an itinerary that’s tailored to your group, and we’ll help guide you through the bus rental process. Choose which bus size, amenities, and features are best for you, and our reservation specialists will arrange for your bus and driver to arrive to your pickup location right on time. Need to make any changes to your trip? Just give our 24-hour team a call, and we’ll make the necessary arrangements. Our reservation specialists are available 24 hours a day to reserve the perfect charter bus for your group. Booking a bus is fast and easy-- all you have to do is call us with your itinerary in hand, and we’ll secure your transportation arrangements. No matter where you’re headed, trust National Charter Bus to get you there in comfort and in style! To get started, call our 24-hour team at 1-844-755-0510. We can’t wait to organize your next group trip!